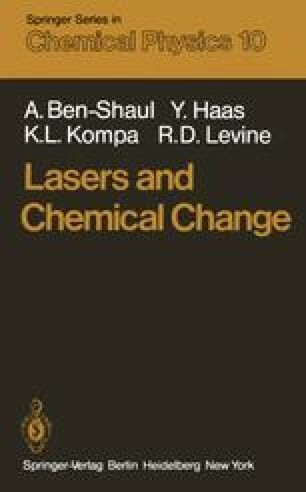 This chapter examines the practice of laser chemistry, in the gas phase. It deals mostly with the use of lasers as means for the preparation of a selectively excited initial state and also documents their application as efficient diagnostic tools. Several case studies are discussed in some detail and attention is given to the principles of the design of the experimental arrangements. The novel type of observations made possible by the use of lasers and the improved spectral and temporal resolution are illustrated by specific applications to concrete problems. Section 5.1 presents an overview of the achievements and prospects of laser chemistry. Bimolecular reactions are discussed in Sect.5.2, starting with the most elementary atom-diatom exchange reactions A + BC → AB + C, in which one of the reactants is excited by a laser. In a bimolecular reaction the relative initial and final velocity distributions of reactants and products are best monitored using the molecular beam method. Experiments combining molecular beams with laser excitation are thus most suitable for analysis and direct comparison with theory. This advantage is often offset by experimental difficulties, necessitating the use of bulk (non-beam) conditions, also discussed in Sect.5.2. Reactions of polyatomic molecules are taken up in Sect.5.3 (single-photon electronic excitation) and in Sect.5.4 (multiple-photon excitation).